A mother and daughter conduct floristic research at Lake Issaqueena — more than 40 years apart. 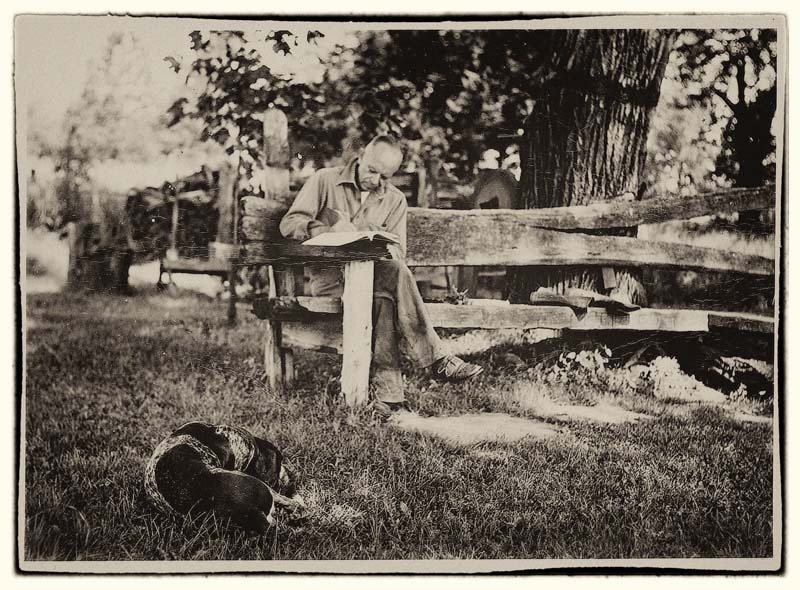 Aldo Leopold, writing outside “The Shack” with his dog Flick. I suppose I’m one of those folks who can’t live without wild things. Neither am I one who takes a burnt orange and northwest purpling October sunset or the joy of walking through the riotous kaleidoscope of leaf-turning in the Clemson Forest for granted. This ethic is essentially a way of living such that we consider ourselves a part of nature and morally bound to steward it for its own sake and the sustenance of future generations. I think that ethic is at the core of who we are — and should be — as sons and daughters of Dear Old Clemson. I grew up in the backwoods of Edgefield, South Carolina. Only about a two-hour drive south of Clemson, the two places are inextricably linked beyond the personal history that has so shaped my life. Two of the men prominent in the University’s establishment — John C. Calhoun and Benjamin Tillman — hail from my home place. However, growing up I didn’t have any clue that I would somehow find my way to the place formerly known as Fort Hill. My focus coming up as a feral farm boy meant that jumping puddles, climbing trees, skipping stones and wandering in the woods took priority over things like history. My family’s time on the 200-acre farm nestled in the middle of the Long Cane Ranger District of the Sumter National Forest was taken up with more important things. There were cattle and hogs and chickens to care for. There were crops to be planted. There were forests to be tended for lumber and firewood. There were fields to be plowed and harrowed for hay. There were gurgling creeks to be fished and always it seemed some fallible fence to be mended. There were three television stations — sometimes — and no video games. Most distractions were born of something beyond the technical “out there.” Our mother and father — both science teachers — nurtured us in the midst of the naturing to appreciate where our food came from. The system of gardens and cow-keeping and spring-fed plumbing meant that relatively little of what kept us alive came from outside the acreage we owned. A strong land ethic — a love for it all — meant survival for the Lanham family. Years later and 100 miles or so northward I found myself at Clemson in the untimely wake of my father’s sudden death. As a middle schooler, I learned of Clemson’s exploits on the football field and made the choice it seems most South Carolinians have to make at some point between going to school in Columbia or finding a place in Pickens County. Clemson was close enough to home, and I could support our mother and the farm with just a short trip home. With the ties to Edgefield still strong and a preference for a tiger’s paw over a rooster crowing, I found the shadow of the Blue Ridge and a campus swaddled in green more to my liking. Years of watching the sunset burnish the sky in the school’s colors instilled in me that deeply infused “something” that makes the Upstate such a special place. Some might even call the “something in these hills” a love for the land. Coming into the present I find that all those years of woods wandering haven’t disappeared. In fact I’m one of those fortunate enough to call my career and personal passion by the same name — conservation. What’s more, I live in the midst of an incredible place where nature won’t be ignored. Just a few miles up the road, Chattooga whitewater, born just minutes ago of an early morning rain, tumbles over boulders that count their ages in millions of years. The Blue Ridge escarpment’s deeply incised gorges and rich forest-cloaked coves seem more tropical than temperate as they abut the Pickens piedmont. This is where Clemson can boast about its own natural superlatives. It’s here in our own backyard that an extraordinary place like the Clemson Experimental Forest gives us the chance to practice the love and care for land. 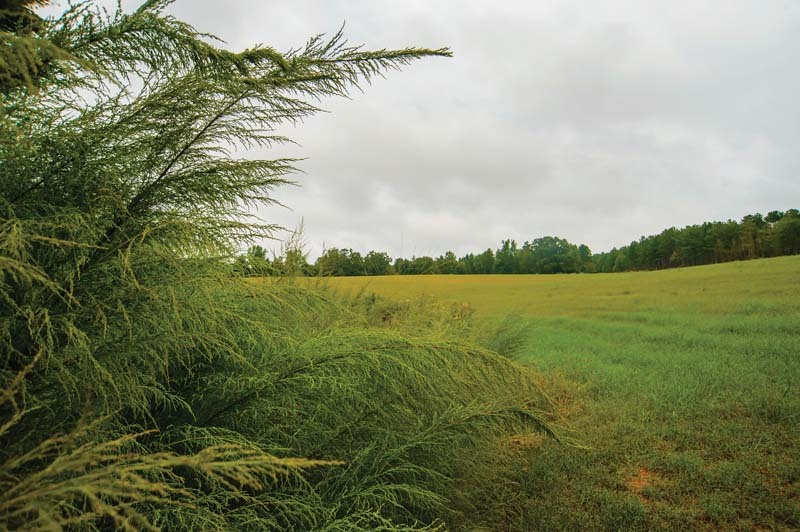 The Clemson Experimental Forest is almost 20,000 acres of land reclaimed from the past two centuries’ abuses of cotton-farming and subsequent erosive soil loss. As Clemson gained momentum as a leading Southern land-grant university in the 1930s — the worst of times — there were those who envisioned better for the farmed-out lands surrounding Fort Hill. When Congress ceded the land and its care to what was then Clemson Agricultural College through the federally provisioned Bankhead Jones Farm Tenant Act, a living laboratory for land ethic was born. At the same time that Aldo Leopold was creating the science of wildlife management and fortifying the foundations of what would become the Land Ethic, trees were being planted, gullies filled and streams cleared to make good again what carelessness had made bad. I’ve seen the old aerial photos of what the college inherited. It was more moonscape than anything. With gullies gashing the land and few trees to be seen, it seemed a hopeless place. But then caring stewardship came in the way of science-based management, research and outreach that made the land-grant mission live in loblolly pines and soil-saving practices. Wildness began to return to the land as white-tailed deer and wild turkeys once again found refuge in a place where boll weevils were more likely to be found than wildlife. As the wounds healed and the land recovered, it has become a showpiece for what hope and care — and love — can do for wildness. In its northern extreme around Lake Issaqueena, the forest is more mountain than piedmont in character. Scarlet tanagers set the hardwoods aflame in spring, and black bear find a safe travel corridor to the lower piedmont. The streams run cold enough for massive black-bellied salamanders, and entomologists find six-legged things dwelling in the riffles that speak to the ecosystem’s stellar health. The southern expanse of forest — most of which is in the region locally known as “Fant’s Grove,” with its wide-open pastures, well-managed forests and winding wetlands — blends into an agrarian landscape that represents tried and true piedmont. Over all the 18,000-plus acres, sustainable timbering practices pay the way as bikers, hikers, birdwatchers, hunters and horseback riders make the forest their place, too. I remember my first visits to the Clemson Experimental Forest when I re-found my wild heart as a zoology undergraduate. It was a new and wonderful world in which to wander. My nature-loving friends and I would marvel over the wetlands. We walked under tulip poplars that towered above us and soaked in the birdsong at dawn and frog chorus at dusk. We mucked knee-deep into newly made beaver marsh, turned stones in Wildcat Creek, spying on salamanders, and looked skyward to watch broad-winged hawks soaring above it all. I’ve sat in vain on a spring morning waiting for a woods-wary wild turkey to come to my call on Bombing Range Road and sat high in a stand on Fant’s Grove hoping a white-tail buck would make a mistake. In those wanderings I’ve often felt more like a child than a college student or professor. Edgefield was my nurturing paradise, the wild place that set the stage for what was to come. Some 30 years since I left that home place and made the northwest corner of the state home, I’m in a place that wraps its wooded arms around me. As I take students afield into the special places to see how it’s all woven and working together — forests, fields, streams, swamps, creeks, rivers, lakes — I think of Aldo Leopold and his maxim of conservation being a “…state of harmony between men and land.” It’s easy then for me to link that to the mission that tasks us with playing the music tunefully and dancing in time to what nature would demand. As I wander along a forest trail on a brisk fall day — a storm of red and gold leaves raining down around me — I think of all that this was, has become and will be. I love this place as I know so many others do, too. Land ethic is the land-grant mission. And all of it is about love. Drew Lanham is Distinguished Alumni professor of wildlife ecology in the School of Agricultural, Forest and Environmental Sciences. 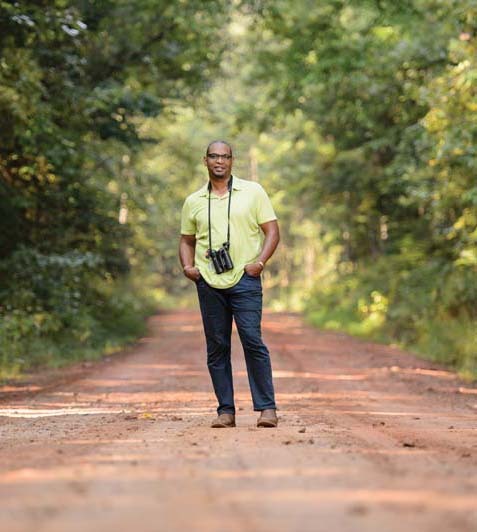 Video: "Ode 2 Birding While Black"
Lanham provides feast for thought about the nature of birding in the United States. He recited this powerful and evocative poem at the first Focus on Diversity: Changing the Face of American Birding Conference at John Heinz NWR on October 22, 2011.